MusicRow, Nashville’s leading music industry publication, is proud to reveal its 2016 Publisher Issue. The October/November issue highlights the music publishing and songwriting community with a directory for premier music publishers and exclusive editorial. The 72-page magazine goes in-depth with coverage of the track writing trend, Benny Brown and Juli Newton Griffith of BBR Music Group, influences of Sony/ATV songwriter Thomas Rhett, revenue sharing with YouTube, and a roundtable conversation with Warner/Chappell’s Ben Vaughn, THiS Music’s Rusty Gaston, and songwriter/entrepreneurs Ashley Gorley and Jeremy Stover. The Expanded Writers’ Notes portion includes exclusive interviews with Florida Georgia Line, Josh Hoge, Kelsea Ballerini, Abe Stoklasa, Andrew Dorff, and Jamie Floyd. CMA Entertainer of the Year nominee Carrie Underwood graces the cover of the 2016 Publisher Issue. Underwood’s Storyteller Tour will wrap Nov. 28 in Utah before she joins Keith Urban to round out the year in Australia and New Zealand. Underwood co-wrote 13 of her 24 No. 1 singles from albums selling in excess of 58 million copies, including her latest gold-certified fifth studio project, Storyteller. 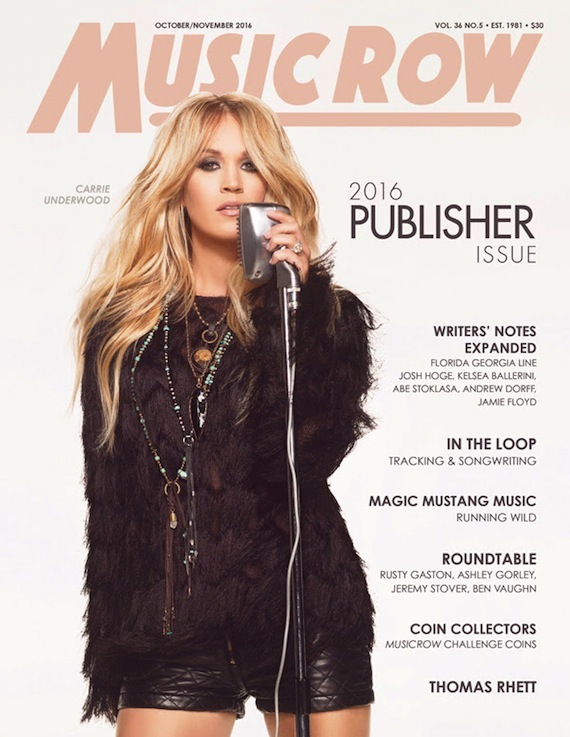 Single copies of the Publisher Issue are available for purchase at musicrow.com for $30, and are included with yearly subscriptions at no additional cost.